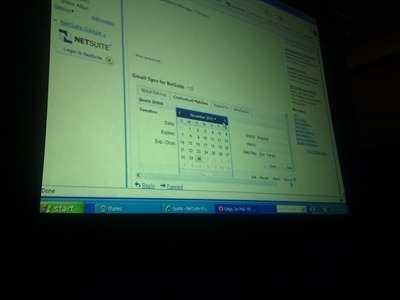 NetSuite Announces SuiteSocial, Takes on Salesforce Chatter. Over the past year I’ve been on something of a crusade to get NetSuite thinking about and acting upon social inside the enterprise. Every time I run into CEO and President Zach Nelson, my standard question is an enquiry into a response to Salesforce’s Chatter product. At the SuiteCloud APAC event today, Nelson announced that NetSuite has a product, built on top of the SuiteCloud platform, that will see social rolled out across the NetSuite application. Slated for release in Q1 2011, SuiteSocial will, in Nelson’s words, take a similar approach to Chatter and allow “data points, not just people, to be social”. A translation of this is that, like with Chatter, SuiteSocial will allow users to subscribe to specific atrifacts within NetSuite – be they invoices, customer cards, inventory items etc. I later spoke with Craig Sullivan, VP & GM, International at NetSuite, who confirmed that the product exists in beta, but expressed surprise that Nelson admitted to the fact publicly – perhaps my incessant questioning gave him the desire to finally give me an answer I wanted to hear! Business is becoming ever more complex and noisy. Salesforce Chatter is heralded by CEO Marc Benioff as a revolution in bringing transparency and visibility of the information that is important to employees within an organization. NetSuite’s lack of a social offering was becoming more glaring, especially given that Chatter has now moved into general availability and is seeing reasonably good uptake (if the salesforce press releases are to be believed anyway). Social really does make a difference to a business. Giving a salesperson, for example, visibility over a particular inventory item that is important to one of their customers, helps to bridge the gap between an organization, its suppliers and its customers. It could be argued that financial data, being the one data type that is common between all organizations, is even a better candidate for social than salesforce with it’s sales-centric data types. When discussion social this evening with Dennis Howlett, his comment was that the measure of social product was if it proves to be meaningful for its users, a social product that is tied to the most central record of note, ERP, is as meaningful as it comes. What else is NetSuite launching? In other product news, and again as an answer to my criticisms of several months ago, NetSuite demoed their Google apps integration. This integration has a dual purpose, firstly it is a single sign on offering that allows authentication to occur between Google apps and NetSuite. more interestingly however it creates an opportunity for a deep and direct integration with the Google apps itself. In the demo we saw, a contextual gadget within a Gmail window allowed a manager to change invoicing information including date (via an integration with Google calendar) and also to approve invoices. The integration, built by a third party NetSuite developer – allows employees to mold their software to the workflow that best suits them – a manager for example who spends most heir time in Gmail, should be able to action ERP-specific functions within their email client – Gmail contextual gadgets make that possible. All in all these two announcements are pretty exciting. As Howlett points out, “Social is on everyone’s deck” – having said that thinking about social and actually doing it are two very different things. I’m looking forward to the release of SuiteSocial and seeing what partners will build on top of it. @ben: “Giving a salesperson, for example, visibility over a particular inventory item that is important to one of their customers, helps to bridge the gap between an organization, its suppliers and its customers. It could be argued that financial data, being the one data type that is common between all organizations, is even a better candidate for social than salesforce with it’s sales-centric data types.” – errr… that already exists in a number of applications and you don’t need social anything to achieve it. Qontext.com provides better-than-Chatter social features tightly embedded into NetSuite (http://bit.ly/eluvjs). As ISVs build their own custom social features, they won’t work well across applications, which just creates “social silos”. Social and collaboration features are needed to work across geography, across function and across application. Qontext social-enables any of your applications out-of-the-box so social interactions can pin to an account record in CRM and also pin to an order in your order entry system. There, for easy reference at any time.